Our big strength is the FD 4x4 Centre specialized workshop in The Netherlands where more then 25 years of experience is combined with capacity and high quality and bespoke accessories to offer you conversions for all your professional and fleet vehicles. 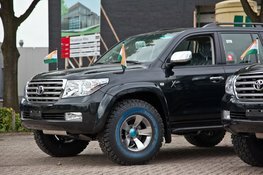 Specialized in Land Rover and Toyota 4x4 vehicles! Our mechanics also travel to fit accessories, repair and service on location!